Outgoing Sen. Claire McCaskill (D., Mo. ), who lost her seat to GOP challenger Josh Hawley in this year's midterm election, condemned the Democratic Party in an interview released Friday for abandoning moderates and demanding "purity." 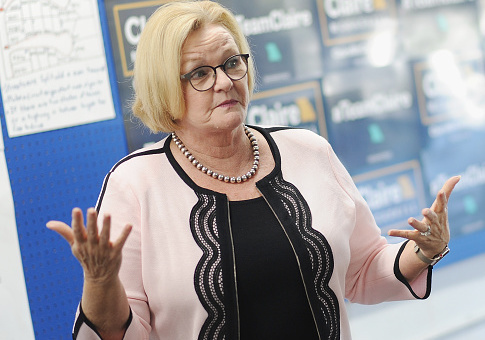 "This demand for purity, this looking down your nose at people who want to compromise, is a recipe for disaster for the Democrats," McCaskill said in the NPR interview, which was flagged by Roll Call. "Will we ever get to a majority in the Senate again, much less to 60, if we do not have some moderates in our party? McCaskill was one of four Democrats who lost their Senate seat during the 2018 midterms, alongside Sens. Heidi Heitkamp (D., N.D.), Bill Nelson (D., Fla.), and Joe Donnelly (D., Ind.). Republican Sen. Dean Heller lost his race to Democratic Rep. Jacky Rosen in Nevada and Democratic Rep. Kyrsten Sinema won the seat being vacated by Republican Sen. Jeff Flake in Arizona, leaving the GOP with a 53-47 majority in the Senate. Republicans may also face issues if they do not find a way to connect with moderate voters, McCaskill warned. "The Republican Party is the party of Donald Trump right now. Now, that really helped him in Missouri. And it helped him in Indiana. And it helped him in North Dakota. But it hurt him in a whole lot of other places. I actually don’t see that getting better for Republicans. And I think there will be Republicans 10 years from now that will look back with regret that they did not stand up and speak out at moments that were critical," she said. McCaskill also condemned the partisan media and self-inflicted "bubbles," saying "We have developed into a society where everyone can go to their chosen news outlet for affirmation and not information. They can go to their chosen websites, their chosen Facebook pages, for affirmation and not information. Everyone gets in their own bubble." In a tweet on Thursday, McCaskill highlighted her "moderate views" against a Twitter user who condemned her for appearing on Fox New and making comments about the migrant caravan. "I support securing the border," she said, adding that "some in my party go too far when they scream at people in restaurants and advocate violence against Republicans."